Canadian Pacific Approached CSX About Merger Deal | The American German Business Club Berlin e.V. Canadian Pacific Railway Ltd. approached CSX Corp about a combination that would unite two of North America’s largest railroad operators, said people briefed on the matter, as the boom in North American energy reshapes the railroad industry. CSX rebuffed the overture, made in the past week, the people said, and it isn’t clear whether CP will persist. CSX rejected Canadian Pacific Railway’s offer to merge the two operators, a deal that would have created a company with a market value of $62 billion. Above, a CSX train. Associated Press. But talk of a combination of such giants shows just how far the railroad business has come roaring back, as rails become ever-more-critical to moving North America’s new abundance of oil. North American railroads have been a major beneficiary of the energy boom, hauling millions of barrels of crude oil. Rail has stepped in where oil fields are developed but pipelines can’t be built, including places like North Dakota, Pennsylvania, New Jersey and Canada’s Atlantic Coast. The half-dozen major railroads operating in the U.S. generated $2.15 billion hauling crude in 2013, up from $25.8 million in 2008, according to federal data. A CP-CSX deal would give rise to an industry giant with a combined market value of about $62 billion and, potentially, an increased ability to exploit the North American energy boom. CSX-controlled rails run from the Midwest to refineries on the U.S. East Coast, but the railroad lacks direct access to North Dakota oil fields. CP does have access to North Dakota oil-loading terminals. A deal would potentially create a single railroad operator that could haul crude from oil fields all the way to fuel-making plants in the Northeast. Berkshire Hathaway Inc. ’s $26 billion deal for Burlington Northern Santa Fe Corp. in 2010. CP, Canada’s second-biggest railway by revenue, has a market value of about $32 billion. Activist investor William Ackman is on the company’s board, and his hedge fund has a big stake in it. 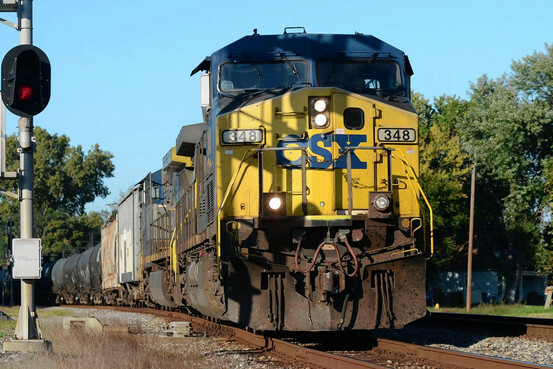 Florida-based CSX, the third-largest U.S. carrier, has a market value of about $30 billion. Combined, the two have about $18 billion in annual revenue and more than 35,000 miles of track. Canadian National Railway Co. , CP’s larger rival, was dropped amid resistance from the STB. Winning regulatory approval for a proposed merger tends to be more difficult when it isn’t welcomed by the target. U.S. national-security officials would also be expected to look closely at any proposed deal between the two, under laws governing foreign ownership of infrastructure such as railroads that is deemed critical. Either way, the approach is a bold move for CP, which had revenue of 6.1 billion Canadian dollars last year ($5.5 billion), making it the smallest of North America’s top six railroads. It is two years into a turnaround effort that began when Mr. Ackman successfully fought to change its corporate strategy, shake up the board and install a new chief executive. CP shares have risen sharply under CEO Hunter Harrison, who has cut costs and improved margins. The company has staked much of its future on transporting oil from Canada’s energy fields in “crude-by-rail” shipments, an alternative to oil pipelines. It has said it expects one-third of its targeted revenue growth over the next four years will be driven by crude-by-rail and plans to invest heavily to expand its operations in Alberta and North Dakota to boost the effort. CP has said it expects to move about 200,000 carloads of crude in 2015, up from 120,000 this year and 90,000 in 2013. CSX’s rail network links to five oil terminals and six refineries along the eastern seaboard, which can be reached from the Chicago interchange within 48 hours, according to the company’s website—crucial assets in efforts to export North American production. But the new oil trade comes with potential problems. Oil from shale rock is gassier than other crudes and could be more flammable in case of a derailment. Several high-profile oil-train derailments and fires have pushed government regulators on both sides of the border to change rules related to shipping hazardous cargo by rail. At a recent investor event in New York state, CP’s Mr. Harrison said railroad M&A “makes sense,” as it would help alleviate traffic-congestion issues at the Chicago interchange, an integral gateway that links the U.S. Midwest with East Coast and West Coast ports. Mr. Ackman’s hedge fund, Pershing Square Capital Management LP, owns about 8% of CP after selling some shares. Mr. Ackman and his partner Paul Hilal sit on CP’s board. CSX is also no stranger to shareholder activism. In 2007, the Children’s Investment Fund and 3G Capital launched a proxy battle to overhaul CSX’s board. The funds successfully elected directors to the company’s board in 2008, but TCI sold off its shares in CSX less than a year later after the railroad’s stock price dropped. Norfolk Southern Corp. launched a hostile bid for Conrail, whose shareholders voted down the CSX deal. The monthslong saga ended with CSX and Norfolk Southern divvying up Conrail’s assets.